The Grafham Sprint 15 Icicle traveller event was run on 19 March and undoubtedly the strong winds forecast put off a number of travellers. In the event 13 travellers joined 4 locals for some good sailing in a South Westerly force 4/5 breeze gusting to force 6. The conditions did not deter new members of the fleet, Christian Mash and Jamie Whitaker from taking part. Christian had bought boat just the week before. The race officer, Mark Rushton and his team, set a trapezoidal course at the western end of the lake and the Sprint 15s were the first start with the Grafham Club fleets following in the later starts. In the first race Robert Finch look an early lead and was first to the windward mark closely followed by Paul Grattage, David Groom and Jan Elfring. Grattage took the lead on the first beat. Further back we saw the first, of many capsizes of the day and like most it was the region of mark 2 where the fresh breeze at the gybe mark caught a number of the sailors napping. Grattage progressively extended his lead from Finch but behind Finch the group of Groom, Chris Tillyer, Elfring and Steve Sawford, were fighting it out for third place and Thomas Sandal and Jenny Ball were not far behind. Sawford took third place on lap 2 and then second on lap 3 but Grattage was in a class of his own, sailing visibly faster and a little freer upwind. So Grattage took the gun from Sawford, Finch, Tillyer and Groom. The second race followed quickly after and it was once again Sawford, Grattage and Finch trading places on the first beat for the lead. Grattage was first to the mark followed by Finch, Sawford and Groom, so very similar to race one. The wind was now much fresher at the gybe mark and Sawford took a swim soon followed by Sandal. Sawford did an incredibly rapid righting only losing a place or two but for Sandal it took longer and he chose to retire as he was paying the price for being out of practice after a long absense. Sawford’s swim left Finch in a clear second place and throughout the race Grattage and Finch extended their lead in first and second places respectively right to the gun. Groom took 3rd from Sawford, Tillyer, Elfring and Ed Tuite Dalton.. 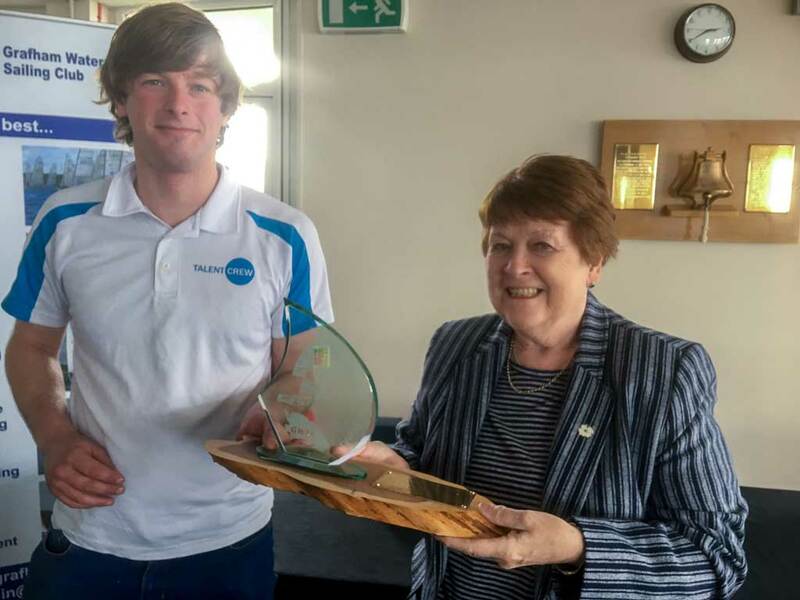 So Grattage won the event for the 3rd year running and was presented with the Chris Black Trophy by Judith Black who had kindly come to present the Trophy she donated 3 years ago. The fleet had a good workout in the fresh conditions and Kevin Cummerson was the only Grafham Club sailor who avoided a swim. This event concludes the Winter Series but the Summer Series starts at Marconi on 8/9 April.